Whisk together the aquafaba, milk, maple syrup, and vanilla in a large shallow bowl until frothy. Add the cocoa powder and whisk until combined. Heat a large skillet over medium low heat. I use my cast iron, other’s have recommended a non-stick skillet if you don’t have cast iron. Dip bread into the aquafaba mixture and let it sit for about 30 seconds to soak up some deliciousness. Transfer bread to the hot pan (I can cook two pieces at a time in my pan), and cook until the first side is firm and starting to brown, about 3-5 minutes. Flip and cook on the second side until it is also starting to brown and has firmed up. 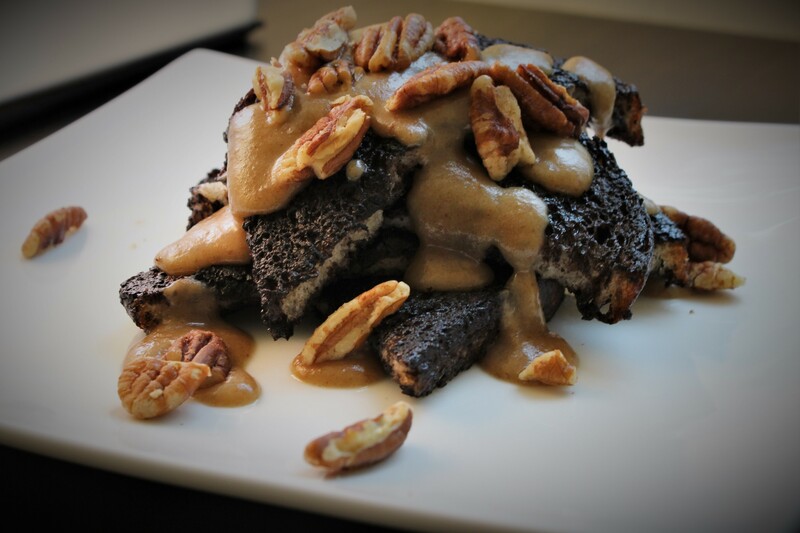 Serve with bourbon date caramel and chopped pecans. Heat ingredients together in a small pan over low heat stirring frequently. 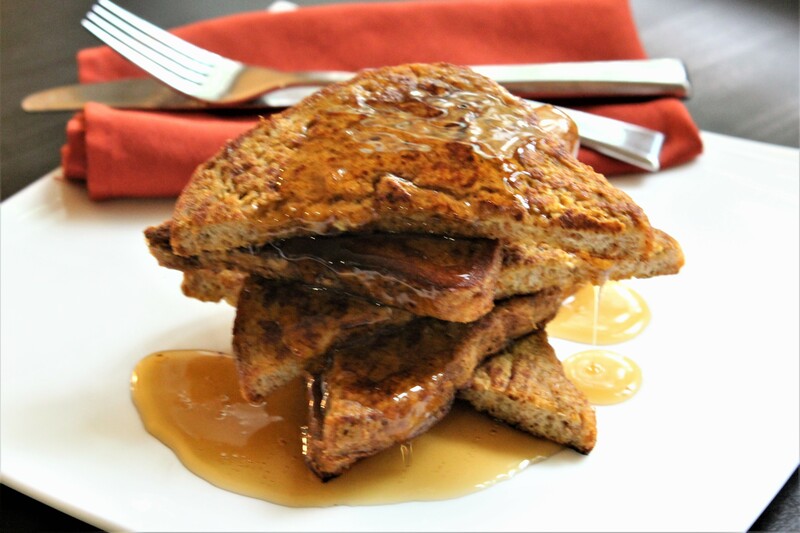 French toast is a lovely, quick breakfast. It is one of my go to breakfasts for my toddler. By using a sprouted grain bread and add a few things I am increasing the nutritional value and converting a quick diner breakfast into a healthy start to you day. I have a few versions, one with pumpkin to continue on my quest for veggies in everything, and this one that just adds a bit more protein and nutrients from the almonds. 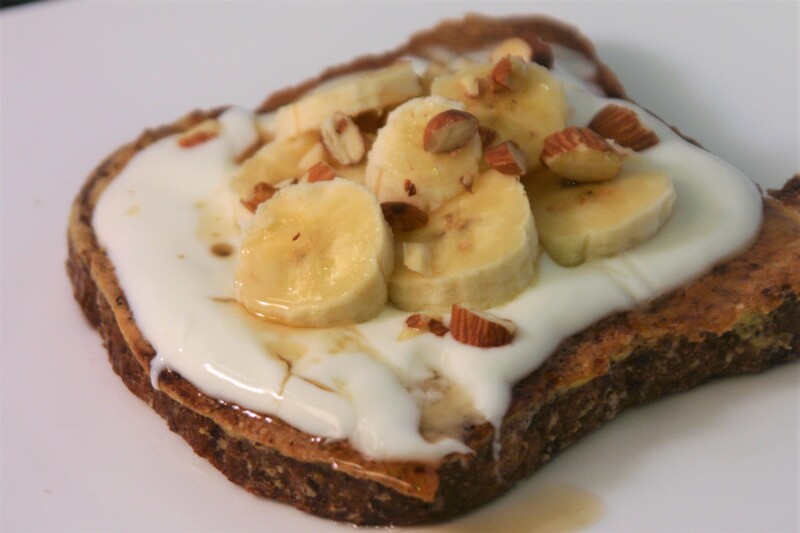 This french toast is filled with almond goodness and bursting in with flavor. I love to top it with plain yogurt, bananas, and a light drizzle of maple syrup. Whisk the eggs in a small bowl until uniformly yellow in color. Add milk, almond meal, vanilla, and almond and whisk to combine. Heat a large skillet over medium high heat, when hot melt a little coconut oil in the bottom, just enough to coat the pan you are using. Dip the bread in the egg mixture one slice at a time making sure each slice is completely coated with egg mixture on all sides. Place egg coated bread in the hot skillet and cook until golden brown on the first side, about 2-3 minutes. Flip and continue to cook until the second side is also golden brown. 2-3 minute more.